First of all I would like to thank the organisers of this event who have given me the opportunity to speak to all of you here at the European Parliament. I would also like to thank all of the delegates, representing different countries, and other guests, who have gone to great efforts to come and attend this event. 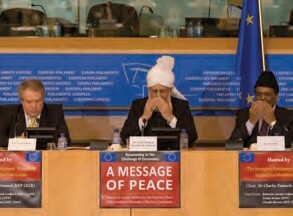 Those people who are well-acquainted with the Ahmadiyya Muslim Jama`at—or Community—or even those who are less well-acquainted and who have contact with individual Ahmadis, will be fully aware that as a Community we constantly draw the attention of the world towards the establishment of peace and security. Certainly, we make full efforts within our resources towards achieving these goals. As the Head of the Ahmadiyya Muslim Jama`at, I regularly speak about such matters whenever the opportunity arises. The fact that I speak about the need for peace and mutual love is not because of any new teaching brought by the Ahmadiyya Community. 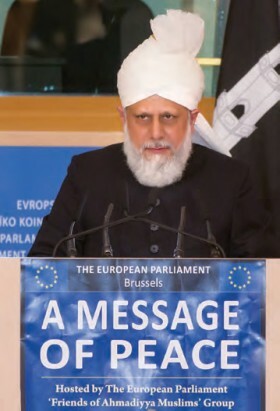 Whilst it is certainly true that to bring peace and reconciliation was one of the major objectives of the advent of the Founder of the Ahmadiyya Muslim Community, the reality is that all of our acts are due to the teachings that were revealed to the Founder of Islam, the Holy Prophet Muhammad(sa). In the 1400 years following the time of the Holy Prophet(sa), the pure teachings he had brought had, unfortunately, been long forgotten by the majority of Muslims. Thus, in order to rejuvenate the true Islam, Allah the Almighty sent the Founder of the Ahmadiyya Muslim Community, Hadrat Mirza Ghulam Ahmad(as) of Qadian, in accordance with the prophecy of the Holy Prophet(sa) of Islam. I would request all of you to keep this point in mind when I come to speak about Islam’s teachings in relation to the development of peace and harmony in the world. I should also mention that there are multiple aspects of ‘peace’ and ‘security’. As every individual facet is important in its own right, at the same time the way each aspect interlinks is also extremely important. For example, the basic building block for peace in society is tranquillity and harmony within the family home. The situation within a home is not limited, but has a knock-on effect on the peace of the local area, which in turn affects the peace of the wider town or city. If there is disturbance in the home it will negatively affect the local area and that will affect the town or city. In the same way, the state of the town or city affects the peace of the entire country and ultimately the state of a nation affects the peace and harmony of the region or the entire world. Therefore, it is clear that if you wish to discuss even a single aspect of peace, you will find that its scope is not limited, but will continue to expand. In a similar way, we find that where there is a lack of peace, different methods are required to solve the issue, based on the underlying problems that exist and upon the particular aspects of peace and security that have been violated. When we bear this in mind, it is obvious that to fully discuss and address these issues in detail requires much more time than is currently available. Nevertheless, I will try to cover at least some aspects of Islam’s true teachings. In the modern world we find that many objections are raised against Islam and much of the blame for the disorder and strife in the world is attributed to the religion. Such allegations are made even though the very meanings of the word Islam are ‘peace’ and ‘security’. Furthermore, Islam is that religion which has given specific guidance on how to establish peace and has laid down certain rules to achieve this. Before I go on to present to you a picture of Islam’s true and peaceful teachings, I would like to briefly discuss the current state of the world. I am sure you will be well versed in these matters already, but I will raise them so that you are able to keep them in view when I come to discuss Islam’s teachings about peace and harmony. We are all aware and accept that today’s world has become like a global village. We are all connected through various means, whether it be through the modern modes of transport, whether it be through the media and Internet or through various other means. All of these factors have resulted in the nations of the world becoming closer together than ever before. We find that in major countries people of all races, religions and nationalities have settled and are living together. Indeed, in many countries there is a significant population of foreign immigrants. The immigrants have become so well-embedded that it would be extremely difficult, or even impossible, for governments or the local people to remove them now. Although attempts have been made to curtail immigration and certain restrictions have been implemented, there are still various means through which a citizen of one nation is able to enter another country. Indeed, leaving aside illegal immigration, we find that certain international laws exist that assist those who are forced to migrate for certain genuine reasons. We also find that as a result of mass immigration, restlessness and anxiety are spreading in certain countries. The responsibility for this lies with both parties—the immigrants and the local people. On the one hand some immigrants provoke the locals by refusing to integrate to any degree, whilst on the other hand some of the locals are displaying a lack of tolerance and open-heartedness. From time to time the hatred boils over to a very dangerous extent. In particular, hatred or enmity on the part of the locals in Western countries is often manifested towards Islam in reaction to the negative behaviour of certain Muslims, especially immigrants. The anger and reaction is not just on a small scale, but can and does reach extreme heights, which is why Western leaders regularly speak about those problems. Therefore, we find that on occasion, the German Chancellor speaks about Muslims being a part of Germany; we find that the Prime Minister of the United Kingdom speaks of the need for Muslims to integrate and the leaders of some countries have gone as far as to give warnings to the Muslims. The internal state of conflicts, if not worsening, at least has become of some concern. These matters might heat up and may lead to the destruction of peace. There should be no doubt that the effect of such conflicts will not be limited to the West but will impact the entire world, especially the Muslim countries. It will cause the relationship between the Western and Eastern World to severely deteriorate. Therefore, to improve the situation and for peace to develop, requires all parties to work together. Governments need to make policies that establish and protect mutual respect, through which hurting the sentiments of others or causing them any type of harm should be outlawed. With regard to the immigrants, they must enter with a willingness to integrate with the local people, whilst the locals should be ready to open their hearts and display tolerance. Furthermore, simply to enforce certain restrictions against Muslims will not lead to peace, because they alone cannot change people’s minds and views. This is not specific to Muslims, but whenever any person is forcibly suppressed due to his religion or belief, it will lead to a negative reaction through which peace will be severely harmed. As I have already said, we find that in certain countries conflicts are increasing, in particular between the local people and Muslim immigrants. It is apparent that both sides are becoming less tolerant and there is a reluctance to get to know one another. The European leadership needs to accept that this is the reality and understand it has a responsibility to establish mutual religious respect and tolerance. This is essential so that within every European country, and between European and Muslim countries, an atmosphere of goodwill develops so that the peace of the world is not shattered. I believe that the cause of such conflicts and divisions is not only religion or beliefs and it is not merely a question of differences between Western and Muslim nations. In fact, a major root cause of the discord has been the global financial crisis. When there was no recession or credit crunch, nobody ever bothered about the influx of immigrants; Muslims or non-Muslims or Africans. However, the situation is now different and that has caused all this. It has even affected the mutual relationships of European countries, and so anger and resentment between the people of certain European nations and the people of other European countries is increasing daily. This state of despair is visible everywhere. The formation of the European Union has been a great achievement on the part of European countries, for it has been a means of uniting the Continent. Thus, you should make all possible efforts to preserve this unity, by honouring each other’s rights. The fears and worries held by members of the general public must be removed. To protect each other’s society, you should be willing to accept fair and just demands of one another, and of course, there should be fair and just demands by the people of each and every country. Remember that the strength of Europe lies in it remaining united and together as one. Such unity will not only benefit you here in Europe, but at a global level will be the means for this Continent to maintain its strength and influence. In fact, speaking from an Islamic perspective, we should strive for the entire world to unite together. In terms of currency, the world should be united. In terms of free business and trade, the world should be united and in terms of freedom of movement and immigration, cohesive and practical policies should be developed, so that the world can become united. In essence countries should seek to cooperate with one another so that division is replaced by unity. If these measures are taken then it will soon become apparent that the existing conflicts will end and be replaced by peace and mutual respect, provided true justice is practiced and each country realises its responsibility. It is with great regret that I must say that, although it is an Islamic teaching, the Islamic countries have been unable to unite amongst themselves. If they were able to cooperate and unite, then the Islamic countries would not need to constantly seek Western aid and help in order to alleviate their internal troubles and needs. With these words, I shall now come to speak about true Islamic teachings in relation to the establishment of long lasting peace in the world. First of all, a fundamental and basic teaching of Islam is that a true Muslim is a person from whose tongue and hand all other peaceful people are safe. This is the definition of a Muslim given by the Holy Prophet Muhammad(sa). After hearing this basic and beautiful principle, can any allegation or complaint be levelled against Islam? Certainly not. Islam teaches that only those who use their tongues and hands to spread injustice and hatred deserve to be punished. Thus, from a local level to a global level, if all parties remained within the confines of this golden principle we would find that there would never be religious disorder. There would never be political strife and nor would there be disorder based on greed and a desire to gain power. If these true Islamic principles are followed, then within countries, the members of the general public will safeguard each other’s rights and feelings and the governments would fulfil their roles to protect all citizens. At an international level each nation would work together with a spirit of true sympathy and compassion towards one another. Another key principle Islam teaches is that, in an effort to develop peace, it is necessary for all parties to never display any form of pride or arrogance. This was perfectly illustrated by the Holy Prophet(sa) when he famously said a black person is not superior to a white person and nor is a white person superior to a black person. Neither is a European greater or superior to any other national, nor are Africans, Asians or the people of any other part of the world. Differences of nationality, colour or ethnicity act merely as a form of identity and recognition. The truth is that in the modern world we all depend upon one another. Today even the major powers, like Europe or the United States, cannot survive by remaining completely isolated from all others. African countries cannot remain isolated and hope to flourish and neither can Asian countries or the people from any other part of the world. For example, if you want your economy to flourish, then you must be willing to embrace international trade. A clear example of how the world is now inter-linked is illustrated by the fact that the European or the world’s financial crisis of the past few years has negatively affected, more or less, every country of the world. Furthermore, for countries to advance in science, or to excel in other fields of expertise, requires them to cooperate and help each other. We should always remember that the people of the world, whether they are from Africa, Europe, Asia or anywhere else, have been given great intellectual capabilities by Allah the Almighty. If all parties utilise their God-given faculties to the best of their abilities for the betterment of mankind, then we will find that the world will become a haven of peace. However, if the developed nations try to suppress the growth and progress of the less developed or developing nations and do not give opportunities to the fertile and bright minds of those nations, then, no doubt, anxiety will spread and the ensuing restlessness will ruin international peace and security. Another principle of Islam to develop peace is that we should not tolerate injustice towards others or for their rights to be usurped. In the same way that we would not accept for our own rights to be taken, we should not be willing to accept it for others. Islam teaches that where retribution is required then it must be proportionate to the act of transgression. However, if forgiveness can lead to reformation then the option to forgive should be taken. The true and overarching objectives should always be reformation, reconciliation and the development of long lasting peace. However, what in reality is happening today? If anyone commits a wrong or an injustice, then the victim seeks to extract revenge in a way which is completely out of proportion and far greater than the original injustice committed. This is exactly what we are witnessing these days in the escalating conflict between Israel and Palestine. The major powers have openly expressed their outrage and concern at the situations in Syria, Libya or Egypt; even though it can be argued that they were, in essence, internal matters. Yet they do not seem to be concerned about, or that concerned about, the Palestinian people. This perceived double standard is causing grievances and malice to increase in the hearts of the people from Muslim countries against the major powers of the world. This anger and animosity is extremely dangerous and could boil over and explode at any time. What will the result of that be? How much damage will be done to the developing world? Will they even be able to survive? How much will the developed nations be affected? Only God knows the answer to such questions. I cannot answer these and nobody can answer these. What we can be certain about is that the peace of the world will be destroyed. Let it be clear that I am not speaking in support or favour of any particular individual country. What I wish to say is that all forms of cruelty, wherever they exist, must be eradicated and stopped regardless of whether they are perpetrated by the people of Palestine, the people of Israel or the people of any other country. The cruelties must be stopped, because if they are allowed to spread, then the flames of hatred will surely engulf the entire world to such an extent, that people will soon forget about the troubles caused by the current economic crisis. Instead, they will face a much more horrifying state of affairs. There will be such a huge loss of life that we cannot even comprehend or imagine. Thus, it is the duty of the European countries, who suffered great losses during the Second World War, to learn from their past and save the world from destruction. To do this, they must fulfil the requirements of justice and be willing to accept their responsibilities. Islam strongly emphasises the need to always act in a fair and just manner. It teaches that no party should be given preferential treatment, or favoured unduly. It should be that a wrongdoer knows that if he tries to act unjustly towards any country, no matter its size or status, he will not be allowed to do so by the international community. If the member states of the United Nations, the countries that derive benefit from the European Union and the countries that are under the influence of the big powers or even the under developed countries all come to accept this, then and only then, peace can emerge. Further, only if those nations who have veto power at the United Nations realise they will be held to account for their actions, can justice be truly established. In fact, I will go one step further and say that the right of veto power can never allow or facilitate the establishment of peace, because clearly not all countries are at an equal level. This is a point I also made earlier this year when I addressed leading politicians and policy makers of the United States, at Capitol Hill. If we look at the voting history of the United Nations we find that the veto power has not always been used to help those who are being oppressed or who are acting in the right way. In fact, we have seen that the veto power has, on certain occasions, been misused to help and assist in cruelty, rather than to prevent it. This is not something that is hidden or unknown; many commentators openly write or speak about this. Another beautiful principle taught by Islam is that peace in society requires one to suppress his anger, rather than allowing it to prevail over principles of honesty and justice. The early history of Islam testifies that the true Muslims always acted upon this principle and those who did not were severely rebuked by the Holy Prophet Muhammad(sa). Yet, today, unfortunately, this is not always the case. There are cases where armies or soldiers, who have been sent to establish peace, conduct themselves in a way that is entirely contrary to their stated aims. For example, in some countries foreign soldiers have treated the dead bodies of their victims in the most disrespectful and horrifying manner. Can peace be established in this way? The reaction to such behaviour cannot remain limited only to the affected country, but manifests throughout the world. Of course, if Muslims are mistreated, Muslim extremists take advantage of it and the peace of the world is shattered, although it is contrary to the teachings of Islam. Islam teaches that peace can only be established by helping both the oppressed and oppressor in a manner that is completely impartial, free from vested interests and devoid of all enmity. Peace is made by giving all parties an equal platform and playing field. As the time is limited, I shall mention just one further point, which is that Islam teaches that the wealth and resources of others should not be looked upon enviously. We should not covet that which belongs to others, because this too is a means for peace to be dismantled. If wealthy countries try to extract and utilise the wealth and resources of less developed nations to fulfil their own needs, then naturally, restlessness will spread. Where appropriate, the developed nations can take a small and fair amount in return for their services, whilst the majority of resources should be utilised to help the under-developed countries to raise their standards of living. They should be allowed to prosper and should be helped in their efforts to reach the same levels as the developed world, because then, and only then can peace be established. If the leadership of those countries is not honest, then the Western nations or developed nations should themselves monitor and organise the development of the country by giving them aid. There are numerous other points I could cover, but due to a lack of time, I shall restrict myself to the few that I have mentioned. Certainly, whatever I have explained represents the true teachings of Islam. There is one question that may arise in your hearts and so let me address it in advance. You may say that if these are the true teachings of Islam, then why do we see such divisions and disorder in the Muslim world? This I have answered earlier by mentioning the need for the advent of a reformer, whom we believe was the Founder of the Ahmadiyya Muslim Community. We, the Ahmadiyya Muslim Jama`at, always endeavour to convey these true teachings to as wide an audience as we can. I would request all of you to also make efforts to raise awareness within your own circles of influence about these issues, so that long lasting peace can be developed in all parts of the world. If we fail in this task, then no part of the world will remain safe from the horrifying and destructive effects of war. I pray that may Allah the Almighty enable the people of the world to rise above their personal interests and desires, in an effort to save the world from the coming destruction. It is the developed nations of the West that hold the greatest amount of power in today’s world, and so it is your duty, above others, to pay urgent attention to these matters of crucial importance. At the end, I would like to once again thank all of you for taking the time to come and listen to what I have said. May Allah bless you. Thank you very much.